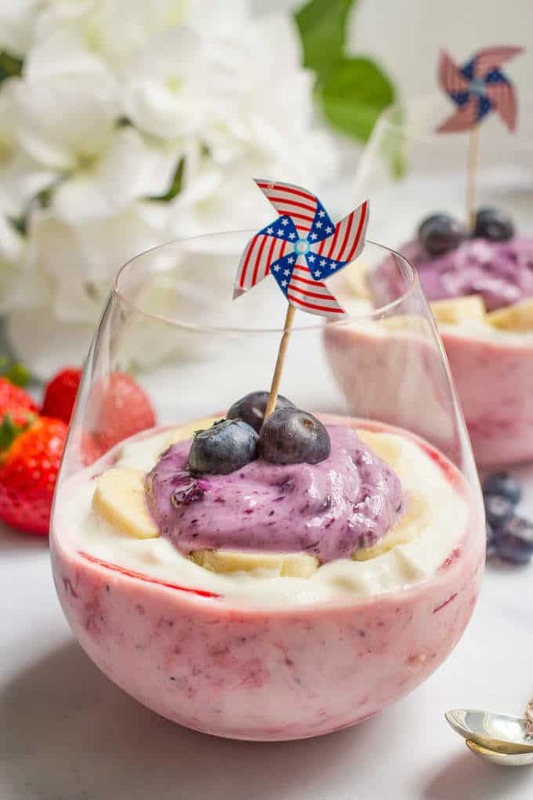 A layered red, white and blue yogurt parfait made with wholesome, natural ingredients, perfect for a festive breakfast, snack or dessert! Happy Friday, friends! I’m super happy to be at the end of this week, coming off of our beach vacation and trying to get back into the swing of things. The kiddos are at separate preschool camps this week and next and my husband was traveling a bit so I feel like I’ve been running around like a crazy person. Ready to kick back and soak up the weekend! I love making special treats for my kiddos that are fun and different and sweet and delicious but still completely wholesome. 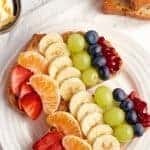 Remember my rainbow toast? And healthy chocolate pancakes? 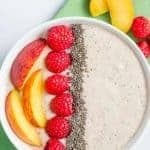 More recently I’ve had mango yogurt pops and peach raspberry smoothie bowls. And with the Fourth of July just around the corner, I wanted some fun festive treats for them and for friends stopping by. But of course, no artificial colors or added sugars, thank you very much. Instead, I use plain Greek yogurt and add homemade mix-ins to control the ingredients and build layers of gorgeous, fruity, sweet flavor. Sweet strawberries on the bottom, honey vanilla and bananas and a bright blueberry topping. When I whipped up these easy yogurt parfait bowls one afternoon and M (who is 5) came wandering in the kitchen asking for snack, she spotted them immediately. M: “Mommy, what’s that?” Eyes wide and excitement in her voice, but thinking it might be an “adults only” kind of treat. I tell her that’s what’s for snack today, if she wants it. Of course I stopped teasing her, but I also found it amusing that she didn’t even know what it was. It looked fruity and creamy and super pretty, which would certainly be enough for me, but she didn’t actually know what she was getting. They both loved these parfaits! Couldn’t decide which layer was their favorite! I used a strained puree of strawberries for the bottom layer but you can absolutely just blend up some strawberries (add a touch of honey if they aren’t very sweet) and stir that in. 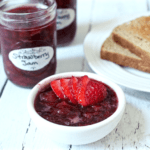 Or even substitute strawberry jam. 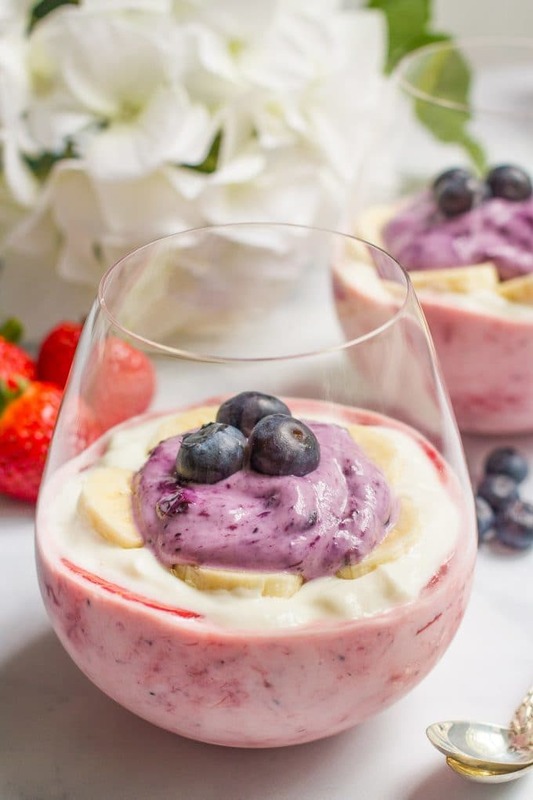 To build the parfaits, carefully spoon each layer into your bowl or glass and use the back of the spoon to smooth out the top before adding the fresh fruit and the next yogurt layer. Try using a martini glass for teens or adults for a fancy twist! 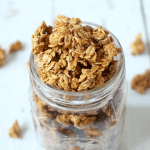 Or mason jars to make these portable for breakfast on the go or a picnic treat. You could absolutely add some additional toppings to these parfaits. 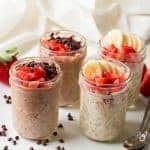 Chia seeds would add a bit of nutrition and fun sprinkle action, or granola or crushed cereal or chopped nuts to give it some crunch and texture. 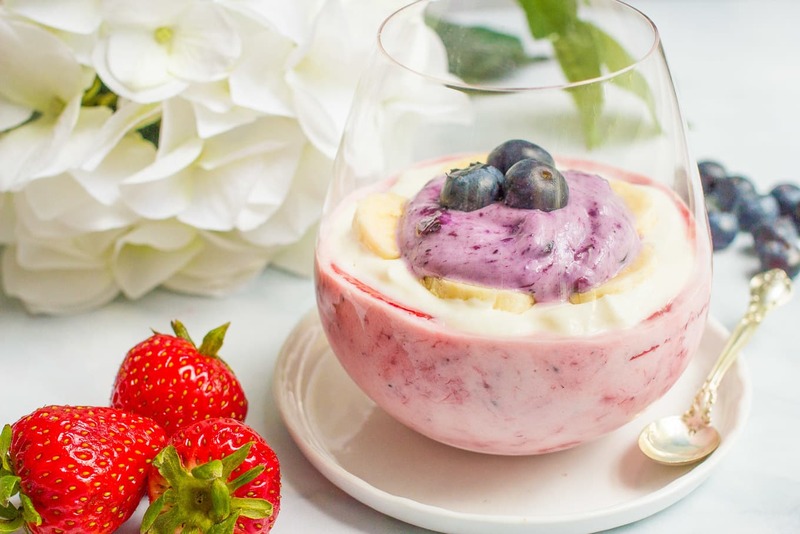 I hope you’ll give these wholesome yogurt parfaits a try and let me know what you think! 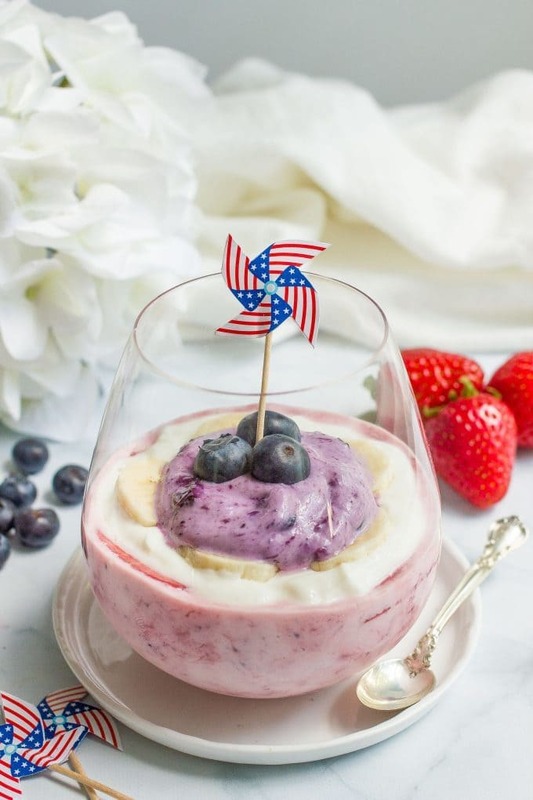 An all-natural layered red, white and blue yogurt parfait for a fun, festive treat! Make the bottom layer: Combine the Greek yogurt and strawberry puree in a small bowl and mix well. Divide evenly among your jars or glasses and smooth the top. Place sliced strawberries on top of the yogurt layer. Make the middle layer: Combine the Greek yogurt, honey and vanilla in a small bowl. Add on top of the sliced strawberries in your jars or glasses. Top with the sliced bananas. 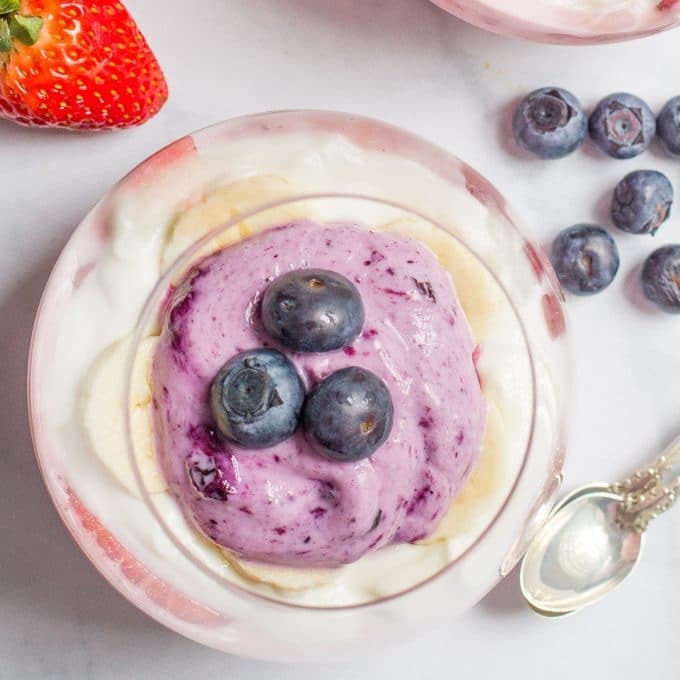 Make the top layer: Combine the Greek yogurt and blueberry syrup (or jam) in a small bowl. Add on top of the sliced bananas in your jars or glasses. 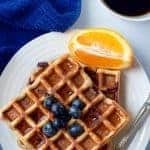 Top with fresh blueberries. Top with any additional toppings as desired and serve! Extras may be kept, covered, in the refrigerator for up to 2 days. I used non-fat plain Greek yogurt for this recipe. what a fun and festive idea here! looks so tasty!! Thanks Rachel! It’s a fresh, fruity explosion! Yum! I love dishes like this that are fun to eat, but healthy, too. This sounds soooo good! I love anything with greek yogurt and have especially been craving fruit lately. I need to make this for a snack soon! Thanks Jenna! All that fresh summer fruit has been calling to me! Oh my goodness! This looks so tasty! Just pinned the crud out of it 😉 I want to make it this weekend! Yummy! My whole family would love this! What a beautiful and creative parfait! Perfect for the Fourth!! Thanks Winnie! They were super tasty! Thanks Sarah! We are a Greek yogurt loving family! I am a total fan of holiday themed food. Thanks for making an amazing holiday themed treat that is healthful too! Yay, me too! Thanks Tara! I just picked up a quart of yogurt from my favorite local raw dairy farm so I’m def making this ASAP. 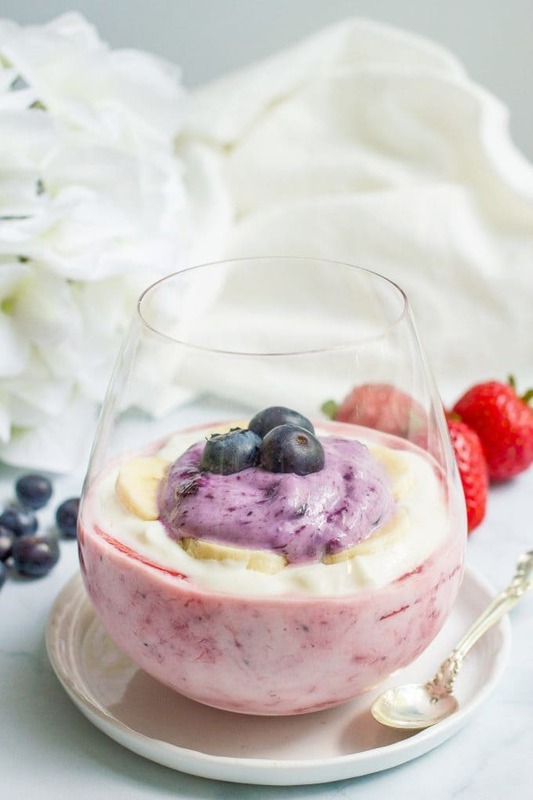 This parfait would be perfect for breakfast every day too! Yay and YUM!